When I moved here I was told it was standard fare at childrens' parties along with fairy bread. Bread spread with butter and then colored sprinkles over the top. The bread is cut into child size triangles. Cadbury in Australia makes a little chocolate frog called Freddo so half the work is done. 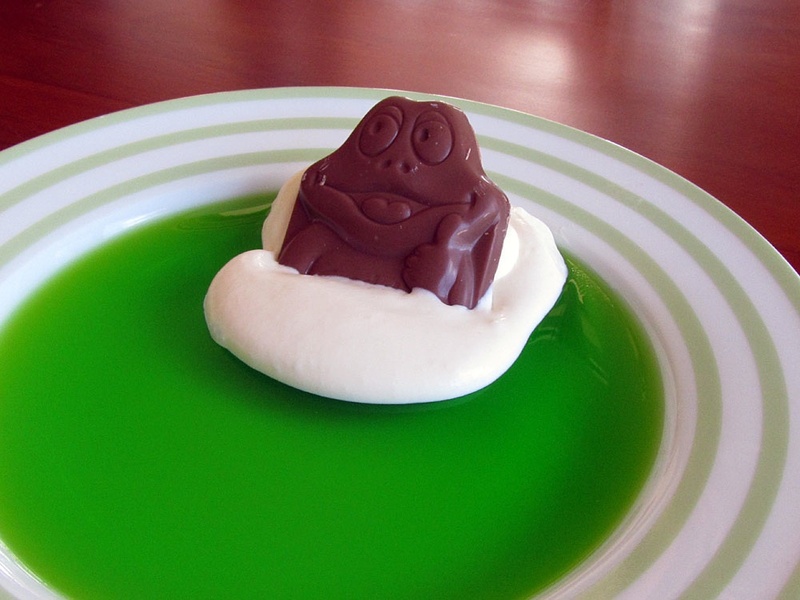 Make the jelly, add the cream and pop on the frog. I did have a friend who went over the top and used a cinnamon quill as a log and nasturtium leaves as lilypads but the whipped cream and chocolate did it for me. We collected my Mum in law from the airport today, its so sweet to see Jasmine interact with Patti (Tamil) for grandma and chat non stop, I couldn't hardly get her to sleep tonight as she was so excited. Exciting times, with the baby arriving, my hubby's brother and his wife are going to visit and then my parents from Scotland! wow, I didn't know you were gonna mention ME in the post. I just sent photos because of your post about frogs in a pond. I think of you every day. This is such an exciting time for you. All those visitors - don't overdo anything. I also love Maureen's blog! Nice to see the 2 of you 'together'! Looks cute! You two can become partner bloggers. This is so much fun. Kids are bound to love it! You are so blessed to have your family around on this exciting time. I feel happy for you. Wish I knew this a couple weeks ago since I had to throw a babyshower with frog theme! Very cute! This would be so much fun to make for kids and watch them eat :) Very cute! Tee hee hee, Orgasmic Chef! Love it, but hope the kids don't figure out what that means.